In New Zealand, BBQ gas bottles must be tested every ten years. It is illegal to fill a gas bottle that is past its expiry date but you are allowed to use it, past the expiry date, if it still contains gas. 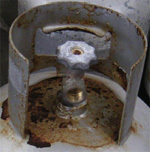 Preparation: At the start of the process the gas bottle is totally emptied of any remnant gas. A degassing station is shown in the picture to the right. The old gas valve is then removed to facilitate the internal inspection. External Inspection: The external surface of the gas bottle is inspected for defects, as defined by the applicable Standard, AS 2337.1-2004. The kind of things they look for are swelling of the cylinder walls, the depth and diameter of any dents, the length and depth of any gouges, the depth and intensity of any corrosion, the presence of any cracks, or any damage from fire or heat. Failure in any one category is cause for condemning the gas bottle. The gas bottle in the picture was condemned for fire damage. Internal Inspection: A flexible scope, with illumination, is used to inspect the inside of the gas bottle. The interior is inspected for rust, scale, corrosion or any contamination. Any gas bottle that fails to meet the Standard is condemned. Cylinder Neck: The neck of the gas bottle is a critical area, as it is the point of attachment for the valve. The valve threads are inspected to see if they are clean and intact, damage free, free of burrs and cracks or any other imperfections that could affect the integrity of the connection. Once again, failure in any area is cause for condemnation. Stamping: Gas bottles that pass all of the tests are stamped with a new inspection date, showing the month and last two digits of the year. In addition the test station stamps its own unique test station mark onto the gas bottle. Both stamps are typically applied in previously unmarked areas of the neck ring, as shown to the right. Valve Installation: The next step is the installation of a new valve, as shown in the picture. 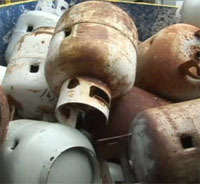 The old valves are discarded and recycled. Refilling: While not part of the formal inspection process, the new valve installation should always be leak tested when refilled. In fact, this is the standard procedure for all subsequent refilling, as well. Refurbishment: In addition to the normal test procedures, over half of the bottles tested by SWAP’n’GO would also be repainted. Many would also be cleaned prior to painting. The end result is a refurbished gas bottle in near new condition, with a new test date stamp that is valid for ten more years. 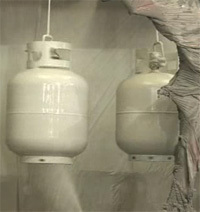 The picture shows gas bottles being repainted on an automated coating line. Recycling: SWAP’n’GO bottles that are condemned are safely retired by punching a large hole in the side, so the metal recycling workers know that they have been safely decommissioned. In addition to recycling the steel from the gas bottles, the brass from the valves is also recycled.